Existing Hotfolder Prints customers may upgrade to the latest version of Hotfolder Prints for just US $88 and receive free upgrades for one year. Please use one of the purchase links below and include your existing Hotfolder Prints name and registration code so that we can verify your details. You can display your name and registration code by running Hotfolder Prints and selecting "Register..." from the "Help" menu. Please cut and paste your details from Hotfolder Prints into the purchase form to avoid mistakes. Accurate submission of these details is essential for prompt processing of your order. When you receive your Hotfolder Prints registration details please download and install the latest version of Hotfolder Prints if you haven't already done so, then run Hotfolder Prints and enter your new registration details. This offer is available to registered users of Hotfolder Prints only. 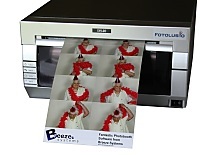 You will be entitled to one year's free upgrades for Hotfolder Prints from the date of purchase. How long will it take to get my new Hotfolder Prints license? Do I need to purchase an upgrade license every time a new version of Hotfolder Prints is released? No, your upgrade license entitles you to 12 months' free updates from the time of purchase. This means you can use any version of Hotfolder Prints released within 12 months of the date you purchased the upgrade. Please see the upgrade information page for more information about upgrades and to download previous releases of Hotfolder Prints. Each Hotfolder Prints licence is a single user, non-transferable licence. It entitles the licence holder to install the software on up to two computers, provided only one copy is used at any given time. If this purchase is for somebody else you must tell us at the time of order.